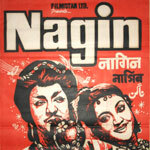 "Nagin" is a 1954 hindi film which has Vyjayanthimala, Pradeep Kumar and Jeevan in lead roles. We have one song lyrics and one video song of Nagin. Hemant Kumar has composed its music. Lata Mangeshkar has sung these songs while Rajinder Krishan has penned its lyrics.